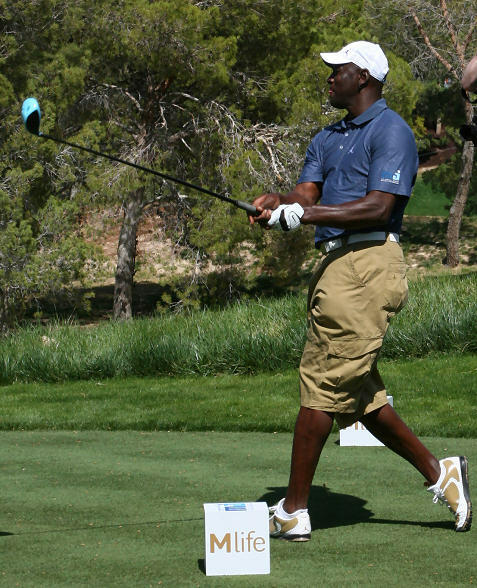 Michael Jordan was in his element, chewing on a cigar and hanging out with his celebrity pals on the stunning Shadow Creek golf course for the 11th Annual Michael Jordan Celebrity Invitational (MJCI). I was parked next the tee box on the 18th hole to get some photos as MJ and his entourage pulled up in their carts with music in the background. Everyone at the tournament was having a great time, but Jordan was top dog as usual. I was in my element as well, enjoying a blowout weekend at the Aria Resort & Casino and hanging out on a beautiful day in the desert as I nursed a hangover from the previous night’s debauchery. As you can see from the slideshow above I had a great view as celebrities from Brandi Chastain, Aaron Rodgers, John Smoltz, Ken Griffey, Jr. and Roger Clemens blasted drives from the 18th tee. A good time was being had by all and the celebs happily mingled with the fans near the tee box. Brandi Chastain and John Smoltz were in the lead following Saturday’s first round of the celeb-only scramble after shooting a six-under par 66. Hall of Fame broadcaster Ahmad Rashad, and teammate and former baseball all-star Roger Clemens, were two strokes back at 4-under. Clemons hit a monster drive on 18. The two-person, 36-hole celebrity-only scramble continues today with winners to be announced at 3 p.m. The winning celebs each will take home $20,000 for their designated charities. It would have been fun to bet a celebrity tournament link this at a site like bwin. The course at Shadow Creek was simply stunning, and it has to be on your list if you’re a golfer heading to Las Vegas. It’s amazing to pull up to this oasis in the middle of the Nevada desert. With the mountains in the background as you can see from the photo above, the beauty of this course ranks up there with some of the best I’ve seen. Check back later this week for more details from my stay at Aria, where the restaurants, nightlife and amenities give you everything you’ll need for a Vegas getaway with your gal or your friends.